Welcome to Body Sense magazine, ABMP's digital magazine for health-conscious consumers. 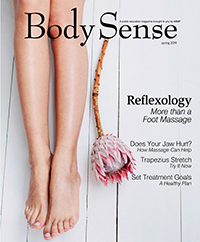 Body Sense magazine is designed to educate consumers on the lasting benefits of frequent massage and bodywork and the value of good stress management. This beautiful publication is published by the editorial team of Associated Bodywork & Massage Professionals. Body Sense blends features on a variety of massage therapy modalities with tips for healthy living. Readers emerge with a better understanding of bodywork, inspired to book another session. The Body Sense philosophy considers massage therapy an integral facet of a healthy lifestyle, not just an indulgence. This is a message worth sharing with your clients. You can send Body Sense to your clients by clicking through to our most recent issue below, and copying the link to share.